Get ready to dance your socks off during our Fundraiser to end ALS! 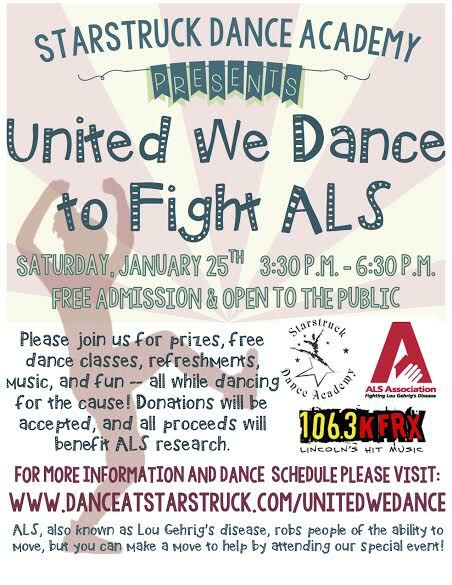 On January 25, 2014, from 3:30-6:30 pm, Starstruck Dance Academy will host a fundraiser in support of ALS. We will be holding free dance classes and selling t-shirts, all donations and proceeds will go directly to the ALS Association to help fight against ALS. KFRX will also be broadcasting live from the studio! Also, please check out our official ALSA event webpage! Make an online donation to our event, here. Download a Pledge form here, and start raising donations for the event of your own! ALS Fundraiser at Starstruck Dance Academy on January 25, 2014.